Growing and nurturing a business is what cleaning company founder Siviwe Mnyaka is all about. He decided to leave the corporate life of marketing behind and ventured into producing, marketing and distributing cleaning products through his company. Mnyaka’s company, Amina Chem, was founded in 2012 and is based in Mthatha in the Eastern Cape. The company has the ability to produce about nine tons of cleaning products a day, which includes 60 different cleaning materials. “We specialise in the manufacturing and marketing of quality cleaning detergents and equipment for both industrial and domestic cleaning and maintenance,” said Mnyaka. 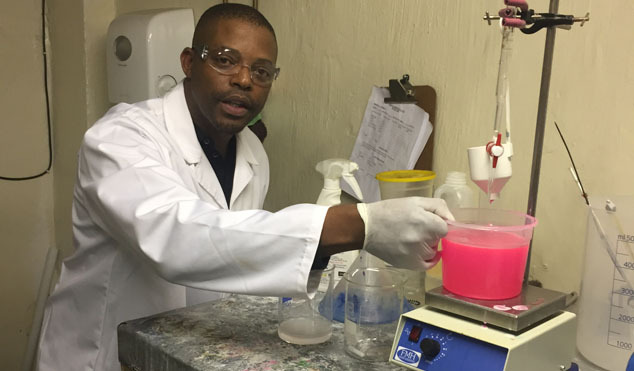 He added that Amina Chem has grown over the years and its turnover is more than a R1 million. In the early days Mnyaka only had two employees but this figure has since grown to 17. Amina Chem’s success can also be attributed to the support it received from the Eastern Cape Department of Economic Development Environmental Affairs and Tourism. The company received R1.5 million from the department for equipment, along with R600 000 from the Small Enterprise Development Agency, which also was ploughed into purchasing equipment. “Since 2012 we have grown from manufacturing products by hand in 200 litre drums to semi-automated stainless steel tanks. This growth resulted in the company moving from a 150m² factory to a 483m². Currently Amina Chem has over 200 regular customers, including several hospitals, Walter Sisulu University as well as funeral parlours, car wash businesses and a bus company. Mnyaka said the experience he gained in the marketing industry has helped him grow his business into what it is today.